Rick Perry: Let's Pull Federal Funds From "Sanctuary Cities"
Days after an undocumented laborer was charged with the murder of a San Francisco woman, former Gov. 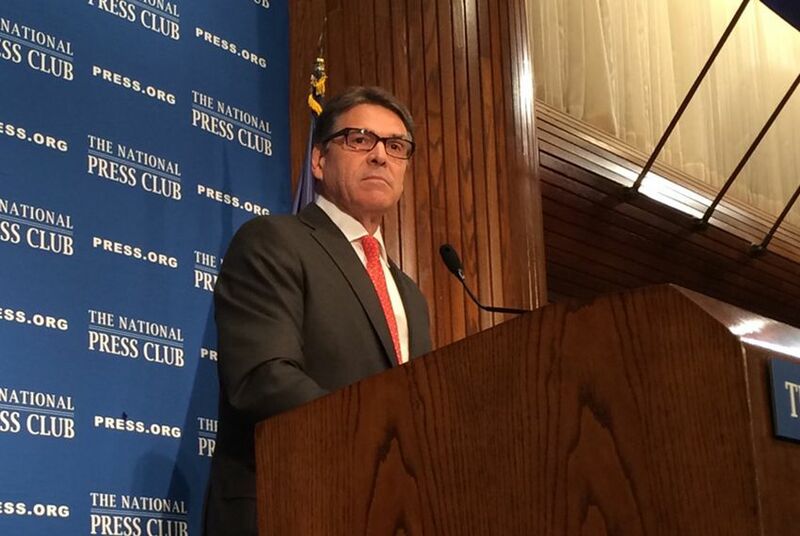 Rick Perry called for federal funding to be pulled from so-called sanctuary cities. Days after an undocumented laborer was charged with the murder of a San Francisco woman, former Gov. Rick Perry called for federal funding to be pulled from so-called sanctuary cities — the common term for local governments that don't enforce federal immigration laws. In a statement, the GOP presidential candidate criticized San Francisco and other American cities "run by left-wing governments" for defying immigration laws and not working with federal authorities to prosecute undocumented immigrants. The alleged gunman, Juan Francisco Lopez-Sanchez, was released by San Francisco law enforcement despite a request by Immigration and Customs Enforcement to notify the agency before his release, according to a CNN report. The mere premise of sanctuary cities is controversial; many Democrats suggest it's a fake concept. GOP lawmakers have not been able to say how many Texas cities qualify, arguing that it's impossible to make such a list without a legal definition of a sanctuary city. Perry's proposal, released via email on Thursday, includes making sanctuary cities ineligible for the State Criminal Alien Assistance Program, a U.S. Justice Department program that awards millions of dollars to local governments to ease the cost of jailing undocumented immigrants. "It’s not fair that some people try to jump the immigration line by coming across our border illegally," Perry said in the statement. "Federal taxpayers shouldn’t be forced to subsidize the irresponsible behavior of these governments." Sanctuary cities should also be prohibited from applying for federal grants, Perry said, and federal immigration officials should be able to access local prisons "so as to verify the immigration status of people in those facilities." This is not Perry's first offensive against sanctuary cities. The former governor added eliminating the local policy to his list of emergency items during the 2011 Legislature. He also called a special session the following summer and added the measure to the agenda. Specifically, the legislation Perry sought would have denied state funds to entities that ban certain law enforcement agencies from inquiring about the immigration status of any person who was legally detained or arrested. The measure didn't pass. The San Francisco murder on July 1 brought sanctuary cities back into the national spotlight. Lopez-Sanchez is a convicted felon from Mexico who had been deported several times. Supporters of sanctuary cities say their policies help local police officers connect with immigrants and strengthen public safety. Democratic presidential candidate Hillary Clinton reiterated her support for the policies in a statement Thursday.